*This post was sponsored by Tobi but all thoughts and opinions are my own. Are you planning a date night for Valentine's Day that's going to require getting a little dressed up? 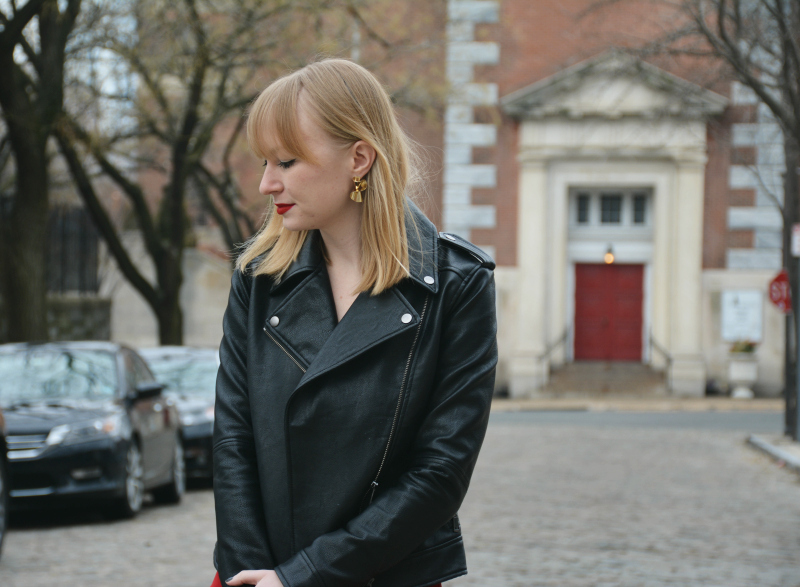 I have the perfect combo for you - a little red dress and a leather jacket! A red dress is a classic, go-to piece for Valentine's Day but red is such a fun color to throw on. I always feel a little extra dressed up when I'm wearing red, or even just a red lip! You cab dress up your look even more with gold jewelry and a pair of heels. I love this red dress from Tobi in particular because I love the deep-V and the wrap detail in the skirt. Not only does it make this dress a good option for a Valentine's Day date but it would also be cute for a night out. What are you planning on wearing for Valentine's Day? Wow that dress looks hot! What a hot dress. You are rocking it. Have a great week. That dress looks so pretty. Obsessed with this dress! Amazing post! What a gorgeous dress! I love how you paired it with the moto jacket too! I found a great dress from a asos that I’ll be wearing! That dress was meant for you girl - so chic!! !And you'll be able to lose the jacket and tights and wear it for summer as well! *a GOOD color is what I meant to say! Wow, you look gorgeous in that dress!